Pause and Unwind is currently sold out! I ordered this for a friend and she loved everything in the box! I purchased my mom a monthly box for mother’s Day last year! She loves getting these boxes every month! Mother’s Day lasts all year long for her!! The products were of sufficient size to be useful. Care was put into including just the right mix of items. I look forward to my next box! This is my second box and I'm hooked! Lots of great products and positive affirmation notes. 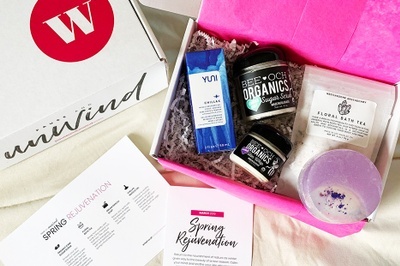 I've tried a number of subscription boxes and this is my favorite. I love reading the stories behind the products and the women who own the businesses. This is the only box that I've kept every item for myself! Keep the great boxes coming! Makes a great gift box for loved ones! This is my second box, and I have it shipped to my office, so I get a treat right there at my desk when it arrives. I love the combination of inspirational and pampering type items. I also love that it supports women-owned businesses. You MUST subscribe! Sent this delightful box filled with goodies to some of my closest friends. They loved the products and stories behind each surprise! Such a great concept for a great cause!